The Royal Geographic Society has recently put together an “Energy IQ” education program to be used nationally at all grade levels. Problem is, it’s funded by the Canadian Association of Petroleum Producers (CAPP). Anyone smell a rat? 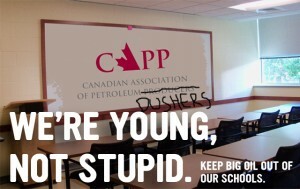 Two high-school students, Sydney Emo & Sophie Yamauchi, were quick to start this petition to denounce the involvement of CAPP, and corporations in general, in schools. Read more at the Institute for Critical Education Studies.